Kathrine Virginia "Kathy" Switzer (born January 5, 1947, in Amberg, Germany) is an American marathon runner, author, and television commentator. In 1967, she became the first woman to run the Boston Marathon as a numbered entrant. During her run, race official Jock Semple attempted to stop Switzer and grab her official bib; however, he was shoved to the ground by Switzer's boyfriend, Thomas Miller, who was running with her, and she completed the race. It was not until 1972 that women were allowed to run the Boston Marathon officially. Kathrine Switzer was born in Amberg, Germany, the daughter of a major in the United States Army. Her family returned to the United States in 1949. She graduated from George C. Marshall High School in Fairfax County, Virginia, then attended Lynchburg College. She transferred to Syracuse University in 1967, where she studied journalism and English literature. She earned a bachelor's degree there in 1968 and a master's degree in 1972. In 1979, the Supersisters trading card set was produced and distributed; one of the cards featured Switzer's name and picture. After her coach insisted a marathon was too far to run for a "fragile woman", Switzer trained for and completed the 1967 Boston Marathon under entry number 261 with the Syracuse Harriers athletic club. It was another five years before women were officially allowed to compete. Her finishing time of approximately 4 hours and 20 minutes was nearly an hour behind the first female finisher, Bobbi Gibb, who ran unregistered. She registered under the gender-neutral "K. V. Switzer", which she said was not done to mislead the officials. She stated she had long used "K. V. Switzer" to sign the articles she wrote for her university paper. She also stated that her name had been misspelled on her birth certificate, so she often used her initials to avoid confusion. Photographs of race official Jock Semple attempting to rip Switzer's number off were widespread in the media. Switzer was issued a number through an "oversight" in the entry screening process, and was treated as an interloper when the error was discovered. Semple attempted to physically remove her from the race while shouting, "Get the hell out of my race and give me those numbers!" Switzer's boyfriend, Tom Miller, a 235-pound ex-All American football player and nationally ranked hammer thrower who was running with her, shoved Semple aside and sent him flying to the pavement, allowing her to proceed. Photographs taken of the incident made world headlines. Afterward, Boston Athletic Association director Will Cloney was asked his opinion of Switzer competing in the race. Cloney said, "Women can't run in the Marathon because the rules forbid it. Unless we have rules, society will be in chaos. I don't make the rules, but I try to carry them out. We have no space in the Marathon for any unauthorized person, even a man. If that girl were my daughter, I would spank her." Because of her run, the Amateur Athletic Union (AAU) barred women from all competitions with male runners, with violators losing the right to compete in any races. Switzer, with other women runners, tried to convince the Boston Athletic Association to allow women to participate in the marathon. Finally, in 1972, women were officially allowed to run the Boston Marathon for the first time. I knew if I quit, nobody would ever believe that women had the capability to run 26-plus miles. If I quit, everybody would say it was a publicity stunt. If I quit, it would set women's sports back, way back, instead of forward. If I quit, I'd never run Boston. If I quit, Jock Semple and all those like him would win. My fear and humiliation turned to anger. Switzer was the women's winner of the 1974 New York City Marathon, with a time of 3:07:29 (59th overall). Her personal best time for the marathon distance is 2:51:37, at Boston in 1975. When I go to the Boston Marathon now, I have wet shoulders—women fall into my arms crying. They're weeping for joy because running has changed their lives. They feel they can do anything. She was inducted into the National Women's Hall of Fame in 2011 for creating a social revolution by empowering women around the world through running. Since 1967, she has worked to improve running opportunities for women in different parts of the world. In 2015 Kathrine Switzer launched her global non-profit 261 Fearless with an ambassador program, club training system and events. 261 Fearless uses running as the means to empower women to overcome life obstacles and embrace healthy living. For the 2017 Boston Marathon, bib number 261, the same number Switzer was assigned in 1967, was assigned to her as "Switzer, Kathrine V." This marked the 50th anniversary of her historic marathon. She was placed in wave 1 and corral 1 and finished in 4:44:31. Also in 2017, the Boston Athletic Association announced it would not assign bib number 261 to any future runners, as an honor for Switzer. It was her ninth Boston Marathon. She was leading a team of runners from her nonprofit, 261 Fearless, Inc., which she hopes will connect and empower women through running. And rather than being the only official woman in the race like in 1967, she was joined by over 13,700 women—almost half of the total runners. Also in 2017, she ran the New York City Marathon, which marked the first time she had run it since 1974; she finished in 4:48:21. In May 2018, Switzer was the commencement speaker at the 164th commencement of Syracuse University, and received an honorary doctorate of humane letters degree. In 1968, Switzer married Tom Miller, the man who had shoved officials for her while running the Boston Marathon in 1967. They divorced in 1973. Switzer married and divorced public relations executive Philip Schaub. She later married British-born runner and author Roger Robinson in 1987. ^ Milde, Horst (June 2, 2010). "Kathrine Switzer and Roger Robinson visit the Berlin Sports Museum". German Road Races e.V. Archived from the original on March 8, 2014. Retrieved March 19, 2013. ^ Lorge Butler, Sarah (April 12, 2012). "How Kathrine Switzer paved the way". ESPN-W. Retrieved July 13, 2012. ^ a b c d Lodge, Denise (April 16, 2012). "Kathrine Switzer: Empowerment through Running". Impowerage Magazine. Retrieved May 10, 2012. ^ Milde, Horst (January 5, 2012). "Katherine Switzer 65 Jahre - GRATULATION der Laufpionierin!". German Road Races e.V. (in German). Archived from the original on March 29, 2014. Retrieved March 19, 2013. ^ a b 1949-, Derderian, Tom, (1996). Boston Marathon : the first century of the world's premier running event. Champaign, IL: Human Kinetics. p. 302. ISBN 0880114797. OCLC 33160969. ^ a b c "Lady With Desire to Run Crashed Marathon" (PDF). The New York Times. April 23, 1967. Archived from the original (pdf) on March 6, 2012. Retrieved November 2, 2014. ^ King, Jennifer (August 22, 2015). "First women graduate from US Army Ranger School as gender barriers continue to fall". Australian Broadcasting Commission. Archived from the original on August 22, 2015. ^ a b "1967 Boston Marathon: The Real Story - Kathrine Switzer - Marathon Woman". Archived from the original on March 22, 2017. Retrieved March 8, 2017. ^ Grinberg, Emanuella. "1st woman to officially run Boston Marathon to do it again 50 years later". CNN. Retrieved April 17, 2017. ^ Cope, Myron (April 22, 1968). "Angry Overseer Of The Marathon". Sports Illustrated. Retrieved December 5, 2012. ^ Semple, Jock; Kelley, John J.; Murphy, Tom (1981). Just Call Me Jock: The Story of Jock Semple, Boston's Mr. Marathon. Waterford Publishing. pp. 7, 114–118. ISBN 978-0942052015. ^ Concannon, Joe (April 5, 1987). "1967: Semple Meets Switzer. Versions vary but everyone remembers that infamous marathon". Boston Globe. ^ Sarah Lorge Butler (2012-04-12). "How Kathrine Switzer paved the way". ESPNW. Retrieved 2017-03-27. ^ "The Girl Who Started It All". Runner's World. 2007-03-06. Retrieved 2017-03-27. 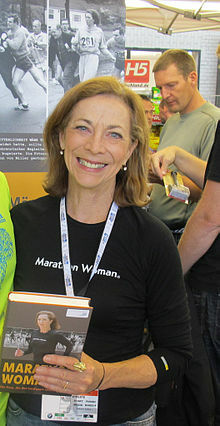 ^ Kathrine Switzer (2012-04-16). "Boston, 1967: When marathons were just for men". BBC. Retrieved 2017-03-27. ^ PBSAmerica (August 15, 2013). "MAKERS: Women Who Make America (Ep1) Awakening - PBS America" – via YouTube. ^ Romanelli, Elaine (1979). "Women in Sports and Games". In O'Neill, Lois Decker. The Women's Book of World Records and Achievements. Anchor Press. p. 576. ISBN 0-385-12733-2. ^ "1967 Boston Marathon: The Real Story - Kathrine Switzer - Marathon Woman". Archived from the original on March 22, 2017. Retrieved March 8, 2017. ^ a b Switzer, Kathrine (2007). Marathon Woman. New York: Carroll & Graf. p. 270. ISBN 978-0-7867-1967-9. ^ "Home". March 26, 2012. ^ a b Switzer, Kathrine (2007). Marathon Woman. New York: Carroll & Graf. p. 290. ISBN 978-0-7867-1967-9. ^ Tom Jackman (September 23, 2012). "Kathrine Switzer, Boston Marathon women's pioneer, started running in Dunn Loring, went to Marshall HS". Washington Post. Retrieved March 27, 2017. ^ "Kathrine Switzer Website". Retrieved April 15, 2014. ^ Zirin, Dave (April 15, 2013). "The Boston Marathon: All My Tears, All My Love". The Nation. Archived from the original on January 15, 2016. ^ "Boston, 1967: When marathons were just for men". BBC News. April 16, 2012. Retrieved May 1, 2012. ^ "Kathrine Switzer Launches Global Non-Profit 261 Fearless, Inc. with an Ambassador Program, Club Training System and Events". Running USA. October 20, 2015. Retrieved May 17, 2018. ^ "About 261 Fearless". 261 Fearless. Retrieved May 17, 2018. ^ "B.A.A. Marathon 2017: Entry List". ^ "Boston Marathon retires Bib No. 261 for women's pioneer". Miami Herald. ^ "The Boston Marathon: How Kathrine Switzer's 261 Became a Symbol for Women in Sports". Newsweek. April 16, 2017. Retrieved May 17, 2018. ^ "Kevin Hart gets serious, beats Tiki Barber in NYC Marathon". Washington Post. ^ "Kathrine Switzer picked to be Syracuse University commencement speaker". syracuse.com. Retrieved 2018-05-14. ^ "When Avon Called, Kathy Switzer Gave Up the Marathon to Organize Women's Racing". People Magazine. May 28, 1979. ^ Switzer, Kathrine (2007). Marathon Woman. New York: Carroll & Graf. pp. 132–33, 203–04, 382–83. ISBN 978-0-7867-1967-9. ^ Lynch, M.A.C. (September 30, 2014). "Legendary Runners Slow Down Long Enough To Marry". Retrieved August 22, 2015. (Registration required (help)).